The final contribution to the construction of the Lunokhod model was the odometer/penetrometer device. Some parts were actually built in parallel with the lid. The odometer was used to measure the travelled distance, since Lunokhod did not have any steering systems the way to go right or left was by stopping the right wheels (if you wanted to go right) or the left wheels (if you wanted to go left), much like a tank. 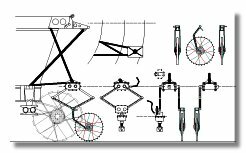 It implied that the wheels could not be used to measure distance so a ninth wheel was necessary, this wheel however was not used when Lunokhod was turning which explains why there was the possibility to lift it. The penetrometer was used to measure the soil resistance. The blueprint for he odometer/penetrometer system is shown in figure 1. The first thing to do was to built the support sturcture, I had to glue the main strut to be able to assemble the secondary struts. In this process it was also necessary to remove a small strut between the RTG heat shield and the lid support strut, oherwise it would have been very difficult to install the odometer/penetrometer support structure (figure 2). The support structure received its primer coat (figure 3) and was then painted and assembled, the small strut was back on the RTG heat shield as shown in figure 4. I then built the odometer wheel out of styren as shown in figures 5 and the odometer fork as shown in figures 6. This was followed by the penetrometer as shown in figures 7 and the lifting motor in figures 8. The last stage of the construction prior to painting was building the girders between the lifting motor and the odometer and penetrometer. It was a very detailled work that required patience (for most of the parts I used 0.25 mm styrene sheets); it was very important to wait at least 30 minutes after each gluing to be absolutly sure that all pieces would stay in place. The construction process is shown in figures 9. The various parts were then painted either in flat aluminium or white satin and assembled as shown in figures 10. The final completed penetrometer and odometer is then shown in figures 11. It is to be noted that even my small enterprise was delocalized for this particular part since most of it was made in China when I spent 10 days in Beijing for a coordination meeting between the various space agencies of the World (it's a good way to spend your lonely evenings far away from home).